we do not be mesmerized with increase in readership by unethical means to boost readership. Staying close to the Bible can help us in cyberspace: “Looking unto Jesus the author and finisher of our faith; who for the joy that was set before him endured the cross, despising the shame, and is set down at the right hand of the throne of God. Hebrews 12:2. Let us focus our readers’ attention on Jesus. Wayne Blank http://www.keyway.ca/htm2002/20021231.htm wrote there are two kinds of pride Selfish pride can be defined as “excessive confidence or glorification in one’s self, possessions or nation.” The concept is found in The Bible, along with pride itself, in words such as arrogance, haughtiness and conceit, among others, all of which are opposite of Godly humility. The wrongness of self-centered pride is essentially twofold. On a spiritual level, it inevitably leads to disregard, disrespect and disobedience to God i.e. self-centered pride is primarily what transformed the once-righteous Lucifer into the wicked Satan after he became too impressed with himself: “I will make myself like the Most High” (Isaiah 14:14 RSV). On a worldly level, selfish pride very often results in self-destructive behavior because, while a form of self-delusion, it isn’t necessarily as much an overestimation of one’s self as it is a dangerous underestimation of others, hence “Pride goes before destruction, and a haughty spirit before a fall” (Proverbs 16:18 RSV). The Bible also speaks of a good form of pride, but there is a difference – it’s based on a pride for others who are living in obedience to God. Dear Heavenly Father, please keep us focussed on You as we blog. Help us not to be tempted to lift ourselves above You. Keep our minds and hearts centred on Jesus only as we blog for you each day. Help us bring others to You, worthy of our worship and adoration. So take all we have and use us for Your honour and glory and bring those You love and have not seen the Light, bring them in from the fields of sin into Your glorious light and life In Jesus’ Name we pray. Amen. 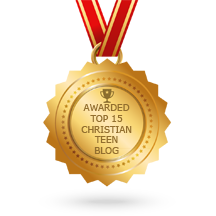 This entry was posted in A CLICK A BLESSING TODAY, CHRISTIAN LIFE AND THE WORD, CHRISTIAN TEENS BLOGS, FAITH CHILD and tagged Fall, glory to God, pride, raise Jesus, self. Bookmark the permalink. A needful blog. You have attacked sin at its base. Pride was the first sin and I believe it is the start of all sin. For example, people get angry because their pride is hurt; they tell a lie to avoid their pride being hurt; they steal to feed their pride, etc. I would hope that the ONLY reason for blogging would be to exalt the Lord Jesus – to present something that He could use to bring non-believers to Himself, and to encourage fellow believers in their Christian walk. Of ourselves, we are nothing. Of ourselves, we could achieve nothing, but He will use a life surrendered to Him, as He works IN us and then THROUGH us to fulfill His purposes. We are humbled that God should choose us and that He would use us. Joining with you . . . Thank you for the principles that we can follow to effectively use the internet for His glory and not our selfish pursuits. Satan will use everything possible to distract us from dong that which is our duty to do. Lord bless you. Thanks for a spiritually enriching study.